در پژوهش حاضر، از یکی از روش‌های جدید توسعه یافته برای پیش‌تغلیظ و اندازه‌گیری مقدار کم نیکل در نمونه‌های آبی و استخراج فاز جامد مغناطیسی با استفاده از نانولوله‌های کربنی مغناطیسی استفاده شد. در این پژوهش برای افزایش انتخابگری از لیگاند α- فوریل دی اکسیم به‌عنوان عامل کیلیت استفاده شد. به‌منظور انجام استخراج، پس از افزودن مقدار بهینه لیگاند به نمونه حاوی نیکل و تنظیم pH محلول روی 9، هفت میلی‌لیتر از محلول جاذب به آن افزوده و به‌مدت 15 دقیقه هم زده شد. سپس فاز آبی و جاذب توسط یک آهنربای قوی جدا شد. در نهایت با شستن آنالیت از جاذب با محلول مناسب، جذب آن توسط دستگاه اسپکترومتری جذب اتمی شعله‌ای اندازه‌گیری شد. پارامترهای مؤثر بر استخراج و پیش‌تغلیظ نیکل بررسی و بهینه شدند. تحت شرایط بهینه، منحنی کالیبراسیون در محدوده 5/2 تا 375 میکروگرم در لیتر خطی بوده و حد تشخیص روش برابر 8/0 میکروگرم در لیتر بود. این روش توسعه یافته با موفقیت برای تعیین مقدار نیکل در نمونه‌های آبی به‌کار برده شد. 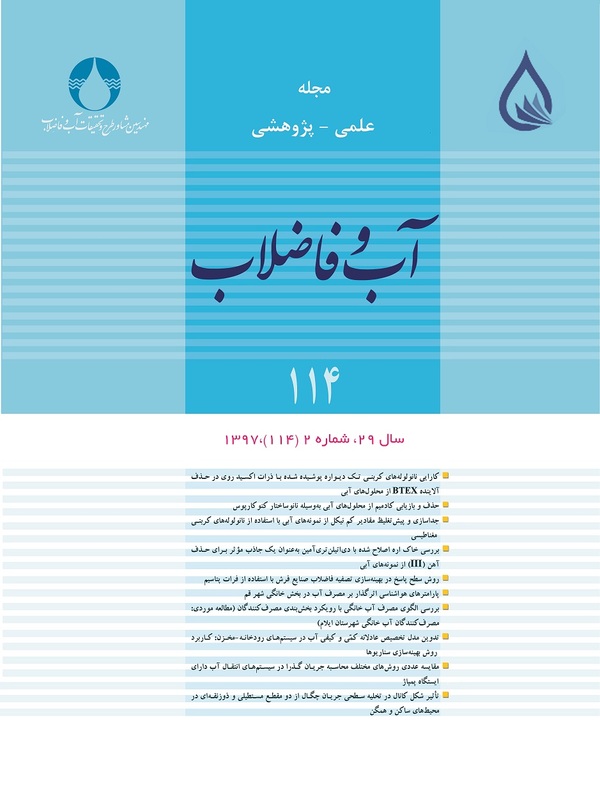 مقدار راندمان نسبی اندازه‌گیری نیکل در نمونه‌های آبی 7/98-1/102 درصد به‌دست آمد. نتایج نشان می‌دهد نانولوله‌های کربنی مغناطیسی می‌توانند به‌عنوان جاذب مؤثر و ارزان برای پیش‌تغلیظ و استخراج نیکل از نمونه‌های حقیقی به‌کار روند. In this paper, a new method for preconcentration and measurement of trace amounts of nickel in aqueous samples by magnetic solid phase extraction (MSPE) via magnetic carbon nanotubes (Mag-CNTs) was developed. In order to increase selectivity, α-Furildioxime was used as chelating agent. In order to do extraction, optimum amount of ligand was added to the nickel sample and pH was set on 9, then 7 ml. of adsorbent was added and stirred for 15 minutes. After that, aqueous phase and adsorbent were separated by a strong magnet. Finally, the absorption was measured via flame atomic absorption spectrometry by analyte elution from the absorbent with an appropriate solution. Parameters affecting the extraction and preconcentration of nickel were investigated and optimized. Under optimum conditions, the calibration curve was linear in concentration range from 2.5 to 375 µg L-1 and the detection limit was 0.8 µg L-1 of nickel. The method was applied for determination of nickel in aqueous samples. The relative efficiency values of nickel measurement in aqueous samples were from 98.7% to 102.1%. Results indicated that Mag-CNTs can be used as an effective and inexpensive absorbent for preconcentration and extraction of nickel from actual samples. Dean, J.A. & Rains, T.C., 1975, Flame emission and atomic absorption spectrometry, Marcel Dekker, New York. Ghaedi, M., Ahmadi, F. & Soylak, M., 2007, "Preconcentration and separation of nickel, copper and cobalt using solid phase extraction and their determination in some real samples", Journal of Hazardous Materials, 147, 226-231. Leong, M. I. & Huang, S. D., 2008 "Dispersive liquid–liquid microextraction method based on solidification of floating organic drop combined with gas chromatography with electron-capture or mass spectrometry detection", Journal of Chromatogrphy A, 1211, 8-12. Nordberg, G. F., Fowler, B. A., Nordberg, M. & Friberg, L. T., 2007, Handbook on the toxicology of metals, 3rd Ed., Academic Press Inc., Waltham, MA, USA. Nunes, J. A., Batista, B. L., Rodrigues, J. L., Caldas, N. M., Neto, J. A. & Barbosa, F. Jr., 2010, "A simple method based on ICP-MS for estimation of background levels of arsenic, cadmium, copper, manganese, nickel, lead, and selenium in blood of the Brazilian population", Journal of Toxicology & Environmental Health A, 73, 878-887. Pourreza, N., Zolgharnein, J., Kiasat, A. R. & Dastyar, T., 2010, "Silica gel–polyethylene glycol as a new adsorbent for solid phase extraction of cobalt and nickel and determination by flame atomic absorption spectrometry", Talanta, 81, 773-777. Sahin, C.A., Efecinar, M. & Satiroglu, N., 2010, "Combination of cloud point extraction and flame atomic absorption spectrometry for preconcentration and determination of nickel and manganese ions in water and food samples", Journal of Hazardous Materials, 176, 672-677. Soylak, M. & Aydin, A., 2011, "Determination of some heavy metals in food and environmental samples by flame atomic absorption spectrometry after coprecipitation", Food Chem. Toxicol., 49, 1242-1248.